The sleep/wake button: This button is on the top of your iPad, and you use it to put your iPad’s screen to sleep or wake it up. Home button (all models)/Touch ID sensor (iPad Air 2, iPad mini 3 and 4, iPad Pro): No matter what you’re doing, you can press the Home button at any time to display the Home screen on your iPad. If you have an iPad Air 2, iPad mini 3 or 4, or iPad Pro, your Home button doubles as a Touch ID sensor, and you can use your fingerprint (or a passcode) to unlock your phone and authenticate purchases. App icons: Each icon shown on the touchscreen launches an iPad app. Twenty apps come with your iPad, and you can add more (many are free) by downloading them from the App Store. Front camera: The front camera comes in handy when you’re FaceTime chatting, but it’s not the best choice for shooting still photos or videos. 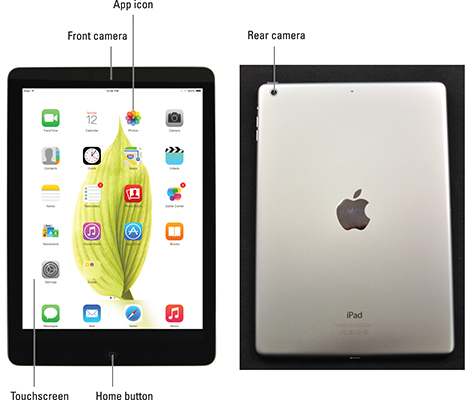 Rear camera: iPads have a better camera on the backside than the one in front, just below the sleep/wake button. The iPad 2’s rear camera captures decent video at 720p and shoots fair-to-middling stills; all other iPads have rear cameras that are better than the front one and shoot superb HD video at 1080p as well as take very nice stills. Volume up and volume down buttons: The upper button increases the volume; the lower button decreases it. Side switch: When the switch is set to silent mode — the down position, with an orange dot visible on the switch — your iPad doesn’t make any sound when you receive new mail or an alert pops up on the screen. Note that the side switch doesn’t silence what you think of as “expected” sounds, which are sounds you expect to hear in a particular app. Therefore, it doesn’t silence the iTunes or Videos apps, nor will it mute games and other apps that emit noises. About the only thing the ring/silent switch mutes are “unexpected” sounds, such as those associated with notifications from apps or the iPad operating system (iOS).